View a complete copy of the new beach grooming law, as signed by the Governor, here, and the key provisions, here. SOS provides “Questions and Answers” about new state beach grooming law click here. Corps of Engineers issues press release offering guidance after passage of state beach grooming bill. Read this press release here. 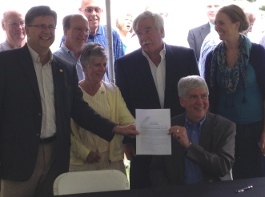 GOVERNOR SNYDER SIGNS BEACH GROOMING BILL INTO LAW! Read SOS Press Release here. Shown with Governor Rick Snyder are Senator Tom Casperson, SOS Attorney Dave Powers, SOS President Ernie Krygier and Senator Casperson’s Legislative Aide, Kendra Everett. BEACH GROOMING LAW GOES TO GOVERNOR’S DESK! After being passed by both the Michigan Senate and the Michigan House on June 14, 2012, the Beach Grooming Bill was delivered to Governor Snyder’s desk on June 21, 2012, and is awaiting his signature to become law. See the final House vote (82 for, 28 against) HERE, and the final Senate vote (27 for, 11 against) HERE. View the enrolled bill in its entirety HERE.